This is an editable, Word document observation tool based on the Kids Matter BETLS Observation tool. BETLS is an acronym for behaviour, emotions, thoughts, learning and social relationships. 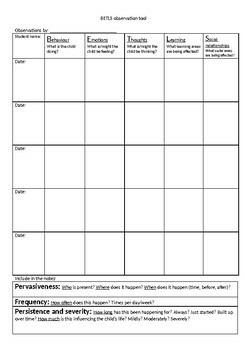 This tool is a template for gathering and documenting information and observations about a child or young person, and your particular concerns.